Growing up I've always been afraid of the dentist. I don't remember when that fear started but I knew the burnt smell when the dentist cleans my teeth with her heavy hand was what scared me. And after sometime, I stopped going to the dentist, I stopped taking care of my teeth. Then I got my dental braces when I was in college and if you had yours too you would know you have to go to your orthodontist every 3-4 weeks to have it adjusted and that hurts! Although there was pain, it was tolerable and I was never scared to see my orthodontist. 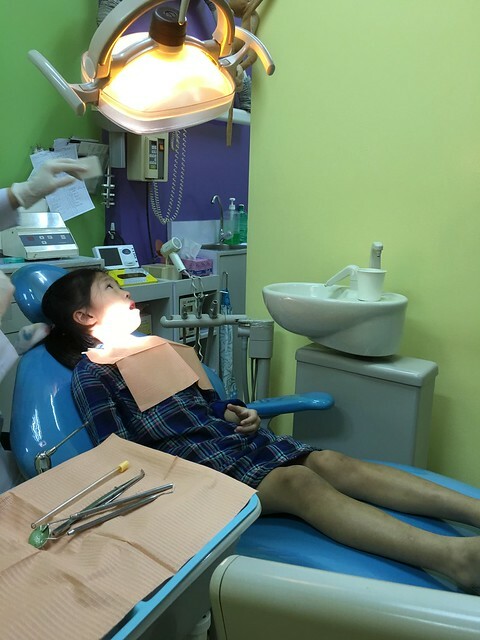 But when she told me to have my regular cleaning, my fear for the dentist came rushing over again and it took me months before actually going to a dentist and by the time I went to see one, I already had a bad case of gingivitis. That was sort of my wake up call. I didn't want to loose all my teeth! I'm such a smiley person pa naman! I found a great dentist thru the referral of a friend. I met the "dentist to the stars". Although he his associate dentists did my cleaning but he would always sees me, explains my condition and his clinic makes me feel "safe". He somehow eased my dental anxiety. I loved his clinic! I can choose songs I can listen to while having my treatment and even watch movies! It felt like I was in a dental spa. I had a few more treatments then I transferred to another company (in Manila), got married, had kids and just thinking of driving to all the way to Makati already stresses me out. I knew I had to find a dentist that's near our house and who's also kid-friendly because I don't want to pass my dental fear to my kids. 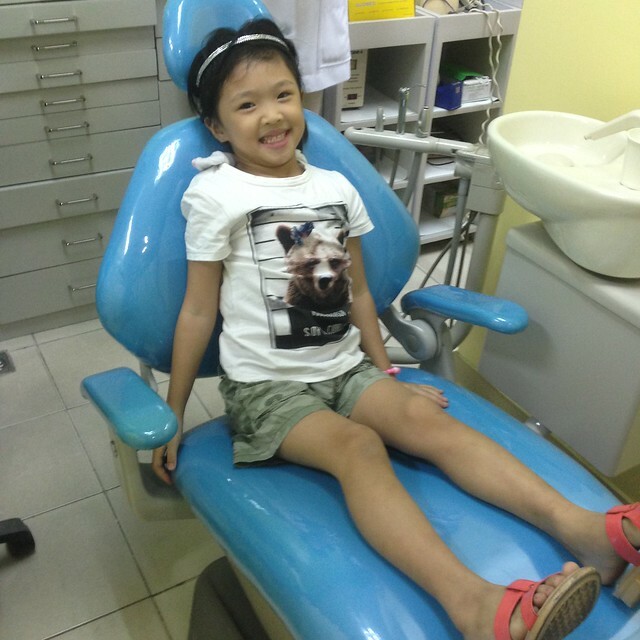 It's been a year now since we are seeing our new dentist (it was also a referral from a family friend). I love her! She explains everything well and she is light-handed, that's what's most important to me. And my kids also love her! And The first time she met Y and R (in separate occasions), she showed them a cute pop-up book about brushing teeth. 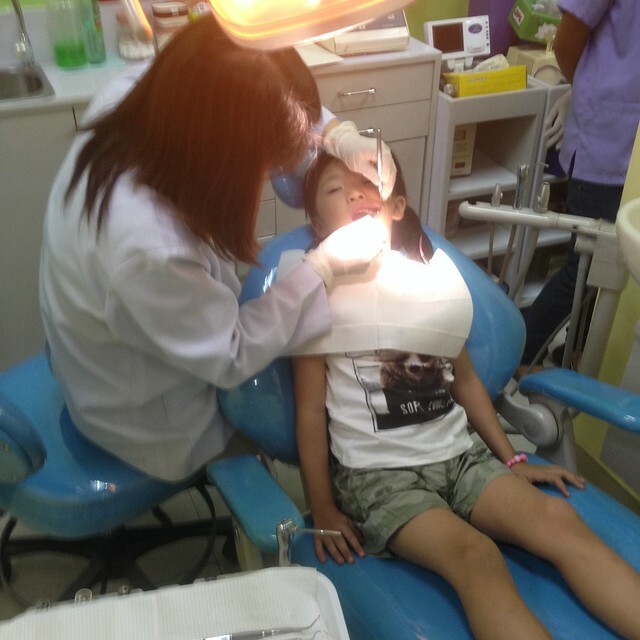 She only counted their teeth on their first visit, cleans their teeth "manually" and the second time and eventually uses a few tools (only when needed). 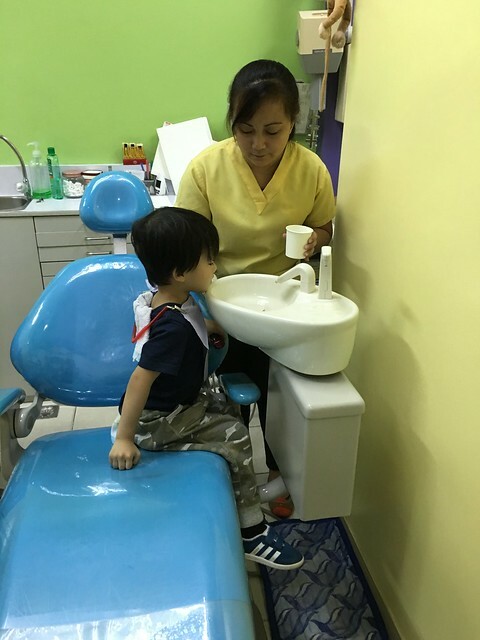 This was Y's first dentist visit early last year. She saw me have my teeth cleaned before she sat on the dentist's chair. It was a successful one! Plus she was eager to get a prize from Dr. Gwen! Dr. Gwen shares clinic with another dentist. Her clinic is always clean and there's a small play area to entertain kids. Her staff are always nice and we never waited for more than 15 minutes. They're very efficient! I always schedule our next visit after our current visit and they would send a text reminder a week before our appointment. 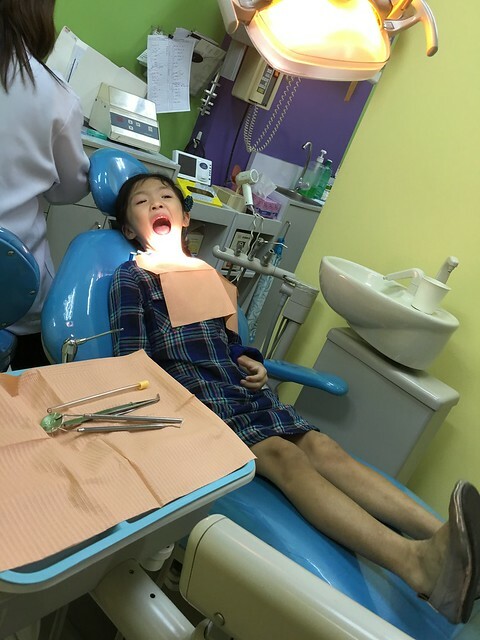 This was R's first dental visit. Dr. Gwen just counted his teeth. It went smoothly and that makes me so proud and a little bit relieved. Hehe! During our visit early this month, I brought the whole family including BOS (who also has dental fear!). It was also R's very first "official" cleaning. 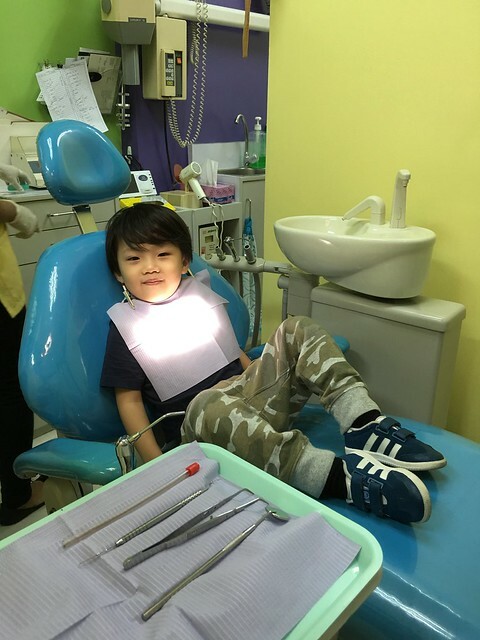 Dr. Gwen asked Achi to go first so Achi can show R how is it done BUT my very brave boy wanted to go first. He was all smiles and so brave. And all done in just a five minutes. I'm so happy it was a success. Then it was Achi's turn naman. Achi is turning six later this year and Dr. Gwen explained to her how her teeth might start move this year or when she turns six, how she has to tell me when it's painful or when it's loose already. Dr. Gwen also briefed me on how I should handle it. Honestly, I am not ready for this stage. It makes me so sentimental because that only means she's growing up. Huhuhu! BOS also had his teeth checked (after I don't know how long!) and turns out he has 4 bad teeth that needed to be extracted. Yikes! So he had two teeth extracted that same day. For one who also has dental fear, he was pretty brave. 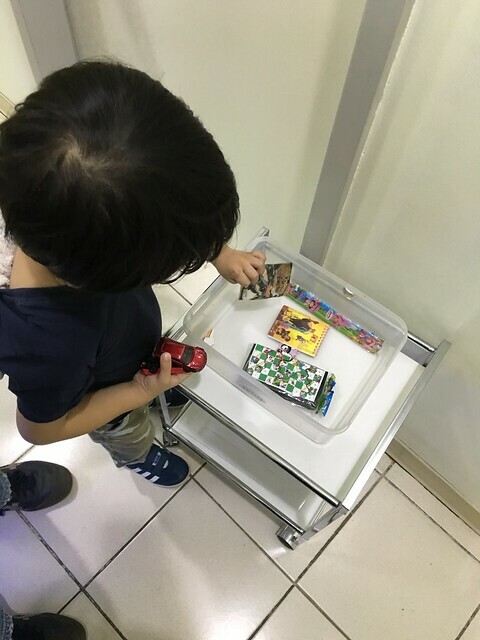 The procedure took about 30 minutes, I had to entertain the kids, take them to a near milk tea place so we won't be able to bother (the clinic is a bit small) them. We went back after 30 minutes to pick him up and Dr. Gwen gave him a list of medicine to take and a after-care reminders. Dr. Gwen told him to send her a text if he has any concerns but before BOS got to send a SMS, she already texted him asking how he is. So happy with the after-care! I'm happy so say I don't have an ounce of dental fear anymore. We're so happy with Dr. Gwen! 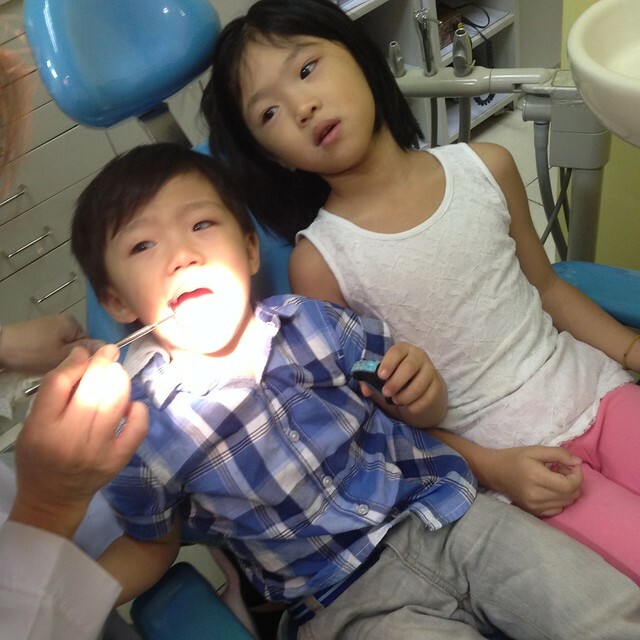 I wanted my kids to have a great dental heath and not be afraid of the dentist. So far, our journey to great dental health as a family is off to a good start. 1. Find a dentist you are at ease with but also one who is light-handed. 2. 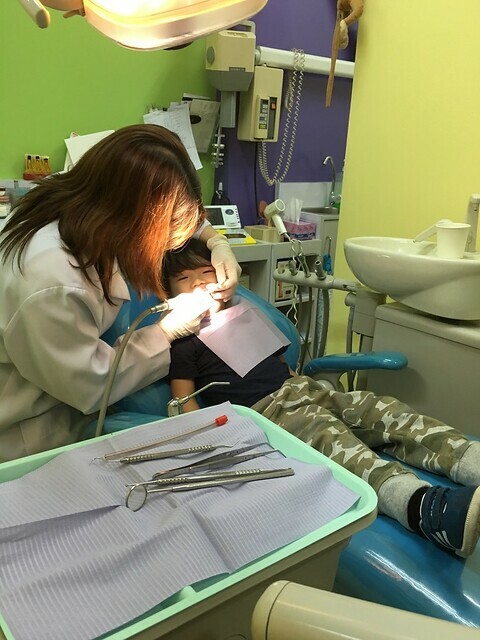 Look for a kid-friendly dentist. Ask your mommy friends for referral. 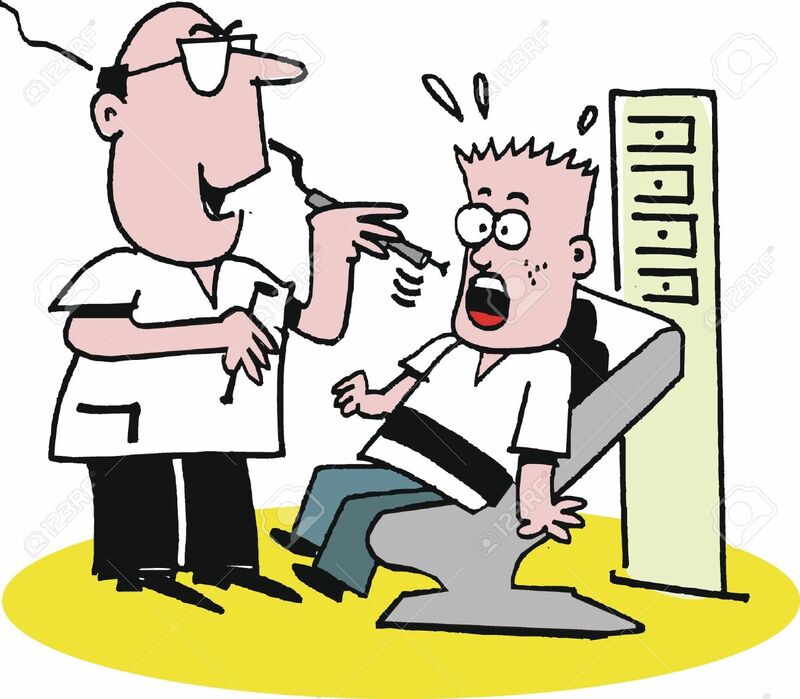 If you have met with the dentist and didn't feel at ease, you always have the option to look for another one. 3. I always psyched my kids one week before our appointment. 4. Dental health should start early, right when the very first tooth erupted. That was my one mistake with Y and that's why she has bad dental health than R.
5. Make brushing teeth a family activity! It's more fun and that way you can check if your kids brush their teeth correctly too! That's it! I hope this entry somehow enlightens you. If you can share how you overcame yours or stories, please do leave a comment below!